Top 15 countries by tobacco production for 2016. Interactive map of tobacco growing. 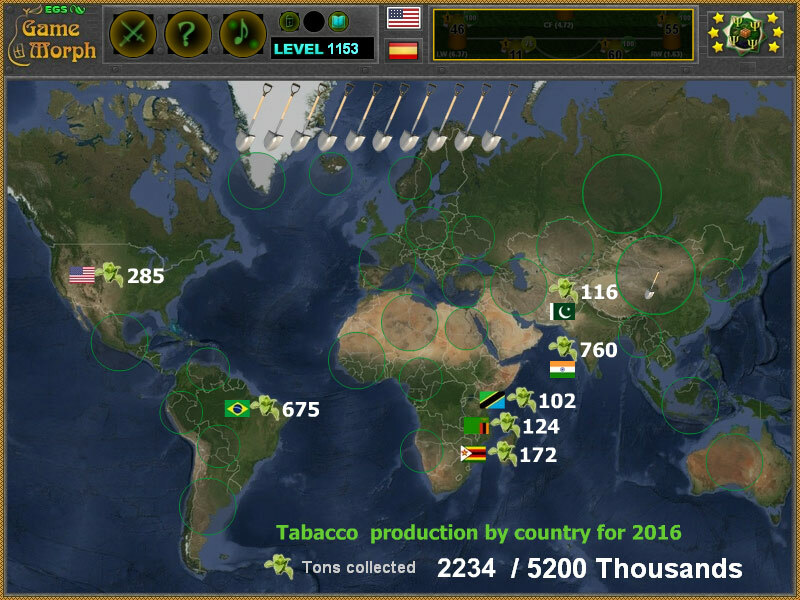 "World Tobacco Production" is a free online knowledge level game to explore the regions, that produce the most quantity of tobacco for 2016. Interactive world map of tobacco production. Click on a region on the map to dig for tabacco, and collect 5.2 million tonnes per year. Fun educational geography game, suitable for online lessons and interactive classes. Minute to win it game. Resource game. How to play World Tobacco Production. Here is the map of the world and 20 shovels on the top of the screen. Click on the locations of the map to see how much tonnes of tobacco that region produce per year. The ammount of the tobacco production will be added in the bottom counter and one shovel will be lost. The task is to collect 5.2 million tonnes of tobacco per year, before you run out of shovels. Know 3 countries that produce the most tobacco in 2016 and get +1 Knowledge Level. Class subject: World tobacco production by country. Tobacco has long been used in the Americas, with some cultivation sites in Mexico dating back to 1400–1000 BC. Many Native American tribes have traditionally grown and used tobacco. Following the arrival of the Europeans to the Americas, tobacco became increasingly popular as a trade item. Tobacco smoking, chewing, and snuffing became a major industry in Europe and its colonies by 1700. Tobacco production rates refered from Factfish. Which country produce most tobacco per year? How many million tonnes of tobacco are produced per year? What are tobacco growing rates for 2016? What is the production of tobacco per year of India? Labels: Resource Games , Interactive Maps , Flora Games , Geography Games , Education Games , Free Online Games.